No Longer Wild as the Hills? Drybarrows Calista hasn’t ever been too wild for a Fellfie! Roy Ottink once described the Drybarrows Fell Ponies as “diamonds in the rough straight from the fell and wild as the hills….” (1) This description was very much on my mind when I decided to import Drybarrows Calista. I took reassurance from David Thompson’s description of Calista as the friendliest pony in his herd of youngstock. Nonetheless, the journey from fell-living in Cumbria to Rocky Mountain living in Colorado requires transit via truck and plane and days of standing in stalls, so I wondered what the pony would be like that I received compared to the one that David sent me. The pony that arrived here, despite the rigors of travel, was indeed the pony that David sent away. I don’t think I’ve ever called a Fell Pony “sweetie” as often as I have Calista in the month that she’s been here. It somehow seems unfair to all the other Fell Ponies I have here to so enjoy this newly arrived one. It appears that Calista is not an anomaly but instead just another representative of the type of pony that David is producing at Drybarrows these days. I agree with Penny’s assessment: “Credit to you for superb breeding!” I look forward to watching the continued evolution of the Drybarrows stud under David’s stewardship, with a little help locally from Calista to interpret it all! Simpson, Claire. “Fell Pony Society & Northern Dartmoor Group Study Day,” The Fell Pony Society Magazine, Autumn 2018 – Volume 37, p. 79. I became acquainted with the Sleddale Fern line of Fell Ponies through a friend who owned one. I was intrigued, then, when another Fern was mentioned in the Chairman’s Report in the Autumn 2018 Fell Pony Society newsletter. It appears we have a lot to thank this pony for. Her late owner Anne Carslaw bequeathed £100,000 to the Fell Pony Society. This pony must have had a special relationship with her owner to inspire that sort of legacy. I appreciate Chairman Peter Boustead helping me figure out which of the Ferns was owned by Mrs. Carslaw. Before long I understood how Fern might have had such influence on her owner. One of Fern’s half-sisters was my first Fell Pony Sleddale Rose Beauty, and Beauty certainly inspired me. That strength of character must be in their genes! The Sleddale ponies are no longer being bred, but their influence obviously continues. Thank you Beauty and Fern and all the rest for your gifts to the humans in your lives. There are lots of stories about Beauty and her strength of character in my books A Humbling Experience and What an Honor, available internationally by clicking here or on the book covers. That’s Beauty on the cover of What an Honor! I am tired. We’ve had a several-days’ run of cold weather, when everything is harder, including pony chores. I am very grateful for this life with ponies, but there are these times when I wear thin. Inevitably, though, something happens to remind me how lucky I am and how important the work I do on behalf of Fell Ponies is. That has been the case the last few days. Words of thanks, support, and encouragement have come from multiple directions, and I am extraordinarily grateful. Then a gift that I can hold in my hands carrying similar sentiments arrived, and it took my breath away. Then when I showed them the picture I’d taken of my ponies a few days before, they replied, “That’s exactly what I had in mind when I saw the ball of wool!” I have never had the pleasure of meeting this person and may not ever because we live across an ocean from each other, but they are uncannily aware of why I do the work I do with and for Fell Ponies. They are always there, however remotely, when I need to celebrate or need encouragement. A friend like that is priceless. The Fell Pony breed is stronger because of connections between people that it weaves, and for that I am grateful, too. More stories about the blessings of life with Fell Ponies can be found in my book What an Honor, available internationally by clicking here . I was spreading hay for the ponies midday when my young dog started barking. I was pretty sure I knew why. She’s decided part of her mission in life is to herd moose. Sure enough there was one lying down on the south-facing flank of the compost pile, and my dog felt it needed to recline elsewhere. For my part, I was thankful for the fence between us as it watched me continue spreading hay, especially when my dog had succeeded in getting it to its feet and it started moving in our direction! It occurred to me to wonder whether my newest pony had seen a moose yet and what she might have thought of a wild animal bigger than her. And I wondered what the largest wild animal was that she’d ever seen on the fell in Cumbria. Then it occurred to me that she might not understand the concept of wild animals. Here my ponies know them as the ones who live on the forest side of the fences. I much prefer encountering moose during daylight hours, especially this time of year when snow covers the ground, making their dark form more obvious. Usually at least I have a little more notice. A few days before, I was walking a pony down the driveway when a cow moose made her presence known, and she had no interest in moving off. My pony and I therefore modified our route instead. I let my pony run up the driveway on her own, and she didn’t veer away from the moose as she passed at a gallop. When I returned up the driveway, though, I did veer away until I realized the moose had finally done the same. At night I rely on my dogs to tell me if moose are about, and I often have no idea how close or far off they are. I’m most likely to encounter them on the long walk down the driveway to the farthest pony paddock. The walk isn’t leisurely if the dogs are barking since I’m actively processing where the object of their attention is. More often than not, though, it’s a quiet walk. Moose are definitely bigger than I am and while I’ve never been charged by one, they do charge the dogs who are usually with me, so I always consider myself potentially in danger. For that reason, when I do get to that last paddock at night without an encounter, I feel myself relax. And it seems a special reward for my efforts when my arrival is met with a nicker. I went through the gate and greeted each of the mares there individually. It was after dark, and I knew who was who as much by their positions relative to each other as by their appearance. It had been a long day with unexpected interruptions from a nail in a tire of my pickup necessitating a trip to town for repair and my husband needing help an hour away loading a recalcitrant piece of equipment. I had squeezed in a pony training session between sundown and dark, putting off my dinner probably longer than I should have. I made my way between the mares and headed toward the hay yard to get them their last feeding of the day. I felt, more than saw, a pony walking close beside me. I stopped and so did she, instantly. We were already nearly touching, so it was natural to reach out and pet her, and then all of a sudden my arms were around her neck, and I was leaning heavily on her shoulder. She stood completely still, letting me take a moment to release and receive. I hadn’t realized how much I needed a hug. After I stood up on my own again, I stepped back to say thank you. I realized, though, that I wasn’t entirely sure which mare deserved my appreciation. I cheated to find the answer by flipping her forelock up to reveal a star. It was Willowtrail Wild Rose, my heart pony, of course. I should have known since I often give her a hug so she knows I like them. Usually, though, when Rose offers something, it’s a tease such as attempting to take my hat as in this picture. Her offer of a hug meant a lot by comparison. What a blessing life is with these ponies. More stories about life with Fell Ponies can be found in my book What an Honor, available internationally by clicking here or on the book cover. I had tacked up my Fell Pony to go on a trail ride. As I usually did, I threw open the paddock gate without having a hand on the reins. What my pony did next speaks volumes about Fell Ponies and this one in particular. Green grass was there to be had just out that gate, so my pony certainly had enticements to move off. It would have been in keeping with the pony character for her to pursue food. On the other hand, I do train my ponies to stand to wait to be mounted, so she should have remained where she was. My mare didn’t do that either, so I suppose you could say she misbehaved. The choice she made, though, I found humbling. She chose to move parallel to the fence. She knew I needed to climb the fence to mount her. This pony chose to facilitate our trail ride instead of eat green grass or stand still as she’d been taught. Sometimes it’s the little things about these ponies that make them so special. More stories like this one can be found in my Fell Pony books A Humbling Experience and What an Honor, available internationally by clicking on the book covers or titles. A visitor remarked that they wished more Fell Ponies were being put to use. The comment came back to my mind when the end of the day took some unusual turns. We stopped at pasture on our way home from work to see Matty and her son Theo. I decided to turn them into a larger area. It was new to Theo, but known to Matty, and almost immediately she crossed the river to get to her favorite grazing areas. Just as I was about to leave, I realized that Theo hadn’t crossed the river, and Matty was ignoring his anxious cries. I dug a halter and lead rope out of the truck and went to find Matty, crossing the river on the road bridge. Matty came to me as I approached, and I haltered her and led her to the river. It had been a long time since I’d ridden her, and I’d never ridden her across the river, but I hopped on and we crossed to the other side and soon found Theo. I put them back in the pasture Theo was accustomed to, putting off Theo’s lesson about river crossing until another day. I had Shelley and her son Chester at home for a day of stall rest after Chester’s castration, but when we got home it was time for Chester to have some exercise. On our way up the driveway when we got home, I had started a generator to charge the batteries for our Airbnb trailer. The generator needed to be shut off, and the paddock of ponies down the drive needed to be fed, so riding Shelley to do these three chores seemed like a perfect solution. I tacked her up at dusk and we headed out for our first ride in a couple of months. My seven month old puppy is showing herding instincts, and she kept Chester moving; he was a little reluctant due to post-surgical soreness. But he soon go into our old riding routine, and we headed down the driveway. We went to the generator first, and both ponies willingly approached the noisy machine. I dismounted to flick the switch then re-mounted, and we headed back up the driveway towards the nearby pony paddock. Shelley paused briefly to nip a flower off a thistle; our freezing temperatures the morning before hadn’t been quite severe enough to arrest the weed’s blooming, so I appreciated Shelley’s “treatment” of the problem. When we arrived at the pony paddock, I tied Shelley to the fence while Chester grazed nearby, and I put out hay for the night. Then I remounted and we continued up the drive to the house, where Chester followed his mom back into their stall, making things easy. Later, as I was cleaning up manure, Chester came to say hello as he used to do when he was younger, and we had a good session of scratches-in-his-favorite-places. I pondered my visitor’s desire to see more Fell Ponies put to use, and I wondered whether riding a mare across a river to reunite her with her abandoned foal or riding a mare to do chores at day’s end would count. No one witnessed these ponies at work except me and their foals and my dogs. I wonder if more Fell Ponies are being put to use than my visitor realizes. Over the years, I’ve seen the phrase ‘riding a powderkeg’ on occasion. Recently I’ve come as close as I’ll probably ever come to personally experiencing it mounted on an equine. I’m pretty conservative and not inclined to mount an equine that is likely to be explosive. And since I almost exclusively ride Fell Ponies, I’m of course fortunate to have usually calm and thoughtful mounts. I received some well-meaning feedback on the photo here. I had submitted it with an application for a competition. I was told it wasn’t acceptable because I was riding a mare with a foal at foot without wearing a helmet. I knew the mare and the foal and their interactions at the time, so I knew as well as anyone can know that I wasn’t in any danger, but the photo was considered to send an inappropriate message about safety. I found another photo for that competition. More recently, it was first thing in the morning, and I was mounted on a mare with her week-old foal at foot. And yes, I was wearing a helmet this time because once again I knew the mare and the foal and their interactions at the time, and I deemed a helmet necessary. We were riding past the stallion pen where the foal’s father was running the fence, both because he hadn’t yet been fed and because there was a new pony, his son, on the move. I could feel the mare under me becoming more and more tense, and while she continued to move where I wanted her to at the speed I wanted, I could tell she was far from content. I considered dismounting because it felt like something big might happen – either I might get assistance in a dismount, or we might be departing at sudden and high speed. After a few moments, we had progressed past the stallion pen, and I could feel the mare relax under me. With the agitated stallion no longer nearby, she was less concerned about the safety of her foal. Dismounting no longer seemed necessary. These days ‘riding a powderkeg’ usually refers to being on a roller coaster or a motorcycle. While I’ve done both those things and I understand how the phrase might apply, I would suggest that being on a mare with foal at foot riding past an agitated stallion is an even more thrilling application of that phrase. Riding a broodmare means there’s another independent-thinking brain involved, capable of making decisions in fractions of seconds, decisions about which the rider may have very little input. I have a much better understanding now why my photo was rejected for that competition. I’m thankful for having had my 'riding a powderkeg' experience, and especially thankful I did it with a Fell Pony who remained thoughtful enough to mind my safety while also minding that of her foal’s. More stories like this one can be found in my book What An Honor: A Dozen Years with Fell Ponies, available internationally by clicking here or on the book cover. There have been a few Fell Ponies whose personalities I could do without, but the two I’m working most with at the moment make up for all the questionable ones. The title here is a shortened version of a quote by the late Mr. Henry Harrison, breeder of the Sleddale ponies. “…it’s the personality of the Fell Pony that means so much, a kind natured pony, ever eager to please and provide good company.” (1) That pretty much sums up the two I’m working with. One of them I have just started under saddle. I’ve maybe taken a dozen short rides on him. And yet on my last one, the longest so far, you could have mistaken him for a seasoned trail pony. He barely put a foot wrong despite going places he hadn’t gone in a year and never under saddle, despite footing varying from ice to mud to dry ground, despite occasional wind gusts, despite having to walk through a mud puddle at the gate, despite his paddock mate calling to him the entire time we were gone. I gave him lots of praise at the end, and he licked and chewed for a long time. I think he enjoyed our outing, too. The other pony is just a few days old, but he comes to me whenever he sees me, appreciates scratches in his favorite places, and accepts lessons willingly. Like the first pony, it’s motivating to work with him because he’s such a sponge for new information and experiences. It’s very rewarding. After my last encounter with these boys, I chuckled as I thought about Mr. Harrison’s statement . I’m convinced it’s the personality of the Fell Pony that makes it so hard for so many of us to have just one. They’re addictive! 1) Harrison, Mr. Henry. January page, 2005 Fell Pony Society calendar. There are more stories about how Fell Ponies bring joy to my life in my book What an Honor, available internationally by clicking here or on the book cover. It was one of those mornings when my chore pony’s coat hadn’t yet seen enough sun to rid itself of the previous night’s snow. She still needed exercising, though, so we began our walk down the driveway side by side instead of me on top of her. It didn’t take long before she had outwalked me. By outwalking me, I mean she had gotten ahead of me to the extent that the lead rope would allow. I keep the rope pretty loose, so she was in front of me by about three feet. I tried to speed up, but she’s a good walker, so eventually I turned her in a circle around me to bring her alongside me again. There’s a reason why we both prefer doing chores with me on top of her; I don’t slow her down that way! When I got my first Fell Pony, my mentor had me hand-walk her somewhere, saying, “She’s a fast walker. You want to walk at her speed, not slow her down. You don’t want her to learn to walk slow. A fast walk is too valuable to lose.” My chore pony is that pony’s daughter. She obviously inherited her mother’s good walk. Riding my chore pony of late I’ve really noticed her good walk. It’s an important characteristic of the Fell Pony breed, of course, since when the ponies were in the packhorse trade, they needed to move along at a good speed at the walk to make the distance they needed to make each day. It’s one of the ground-covering gaits the breed is known for. A few years ago we took pack ponies over Burn Moor in the Lake District. Upon our return to our bed-and-breakfast, our host asked why we’d walked the ponies rather than ridden them. There were several reasons for our choice on that day, but it would have perhaps been more authentic to have ridden a pony and led a pony. It would take a special pair of human legs to keep pace with a string of Fell Ponies walking. Back here at home, the day was mostly sunny, so by the time late-day chores came around, my chore pony’s coat was ice free. There was no question where I was going to be on our trip down the driveway this time, and I enjoyed marveling again at the speed of her walk from a mounted position. This winter we need the snow, so I can’t really complain about having been outwalked because of my pony’s icy coat in the morning. It just makes me more thankful for that good walk when I can experience it from on top! 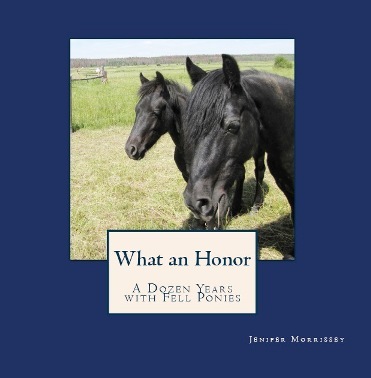 Stories like this one abound in the book What an Honor: A Dozen Years with Fell Ponies, available internationally by clicking here or on the book cover. One of the great benefits of owning Fell Ponies in the internet age is making human friends across the globe with people who also own Fell Ponies. Many of these people I will never meet in person, but they enrich my life nonetheless. One friend in particular made my day when they shared a story about their pony that is a close relation of one of mine. Sometimes it feels like we four are much more in harmony than the distance between us should allow. My management routine for my herd right now has me exercising Willowtrail Wild Rose daily. For the past two weeks it’s mostly been me hand-walking her because I’ve had the flu (protect yourself – it’s awful stuff), and I haven’t been up to riding or anything else. There have been a few times when I’ve been trudging along at my end of the lead rope, slower and slower, and I’ll feel Rose nudge my shoulder or elbow. It could easily be interpreted as a domineering pony misbehaving, but this pony ‘listens’ and ‘communicates’ in special ways. She’s urging me to mount and let her carry me up the road rather than exhausting myself any further. I comply if I can, and she’s foot-perfect taking me home. Rose and H are cousins, despite living on different continents, and they share this uncommon ability to observe and communicate with their chosen human. It does appear there’s something hereditary, since Rose’s daughter, Willowtrail Moonlit Lady, already at just six months old, observes and communicates with me, too, approaching me differently than my other ponies do. These ponies give us human partners incredible displays of insight and gifts of cooperation that we are lucky to get from our human friends. While someone else might say that Rose and H were misbehaving with their nudges and refusals, I prefer to look at their behaviors as something entirely different and definitely in the blessing department. How lucky H’s owner and I are to share our lives with our ponies and each other! Part of morning feeding in my largest pony paddock is tying the mares to the fence to give them their feed buckets. When I have foals in the paddock, this routine is a little more challenging because I have to make sure the foals don’t become entangled in their dam’s lead rope. I once had a foal and mare who were a near-lethal combination in this regard. The foal would put its head over the lead rope, the mare would lift her head and then lower it, circling the foal’s neck with the rope, then the mare would back away, pulling the rope tight around the foal’s neck, at which point both of them started panicking, pulling the rope even tighter. I obviously quickly learned not to leave those two unattended, and I was fortunate that the foal didn’t suffer any physical injury or emotional trauma around ropes. My current foals don’t seem inclined to mess with their dams’ feed buckets, but as a safeguard I’ve been putting hay out close by to entice the foals away from the mares. I did watch one of the foals move towards her dam, though, so I quickly began moving in that direction to intervene before catastrophe struck. Imagine my relief then, when the mare dealt with the situation on her own. She made a protective move that kept her foal from getting between her and the fence and becoming entangled in her lead rope. I have no idea if the protective move was just luck or intentional, but mama got a treat in appreciation! I surely won’t assume that that mare will always watch over her youngster’s well-being as she did that time, so I’ll continue to watch carefully when the mares are tied and their foals are loose. Before long, when weaning time arrives, the routine will change and the foals will start to stand tied, too. Then I become watchful in a different way! If you like stories like this one, you'll also like the stories in the book What an Honor, available internationally by clicking here or on the book cover.